I had started to believe that big breakfasts make you thinner – this theory was stated across forums and has been a baton relay amongst experts who claim to know-it-all. Well, the Germans have a reason to guffaw watching the people around them, and thereby debunking the myth. A group of German scientists have refuted the theory that a heavy breakfast followed by smaller meals make people slim. They base their findings on studies, and have found that people who have heavy breakfast don’t feel the urge to have lighter meals through the day. Under Volker Schusdziarra at the Else-Kroner-Fresenius Center of Nutritional Medicine, Germany, his team performed a study on over 300 people who were asked to note down what they usually ate. The group was mixed, some ate a big breakfast, others a small one and some said goodbye to it altogether. “The results of the study showed that people ate the same at lunch and dinner, regardless of what they had for breakfast,” said Schusdziarra. So, there you have it. 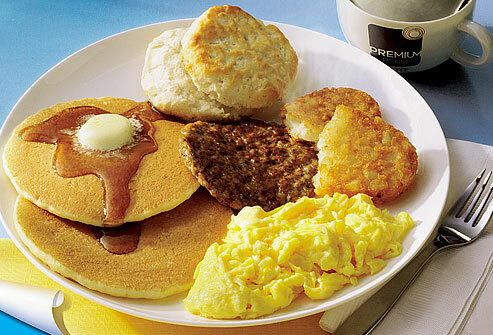 Breakfast like a king, lunch like a prince, and dinner like a pauper is a good fairytale after all. The calories consumed during the day was not equivalent to the arrears consumed in the morning, as per this article in the report. This is in congruence with the calorie-in : calorie-out theory. I have my reservations against this theory, and will discuss it on a later day. For now, if you are reading this post, and having heavy breakfast to lose weight, you know what you need to do, right?